I have no illusions as to my party food reputation. I’m the girl who brings veggies and hummus. Sometimes I’ll get crazy and bring some pita chips too, or add in a container of spinach artichoke dip or guac. But generally speaking, you can count on me to bring something with a little nutrition. Is it the sexiest rep? No, that definitely goes to my friend who is notorious for showing up with a fancy cheese plate. But I like having those types of snacks available, and it turns out a lot of other people do, too — or at least, that’s the impression I get by the fact that it’s usually all gone by the end of the night. Still, there have to be some ways to liven things up a bit for a special event, right? I’d been thinking on this for a while, and when the folks at Que Pasa Foods shared this Super Bowl-ready recipe for 7 Layer Dip with the adorable image above, I knew I had to spread the word. You know, so you could spread the dip! 7 Layer Dip: The Que Pasa version is a good one, using veggie crumbles and fresh avocados, but feel free to get creative by adding in your favorite superfoods, cutting back on cheese, and offering fresh veggies to scoop it all up! 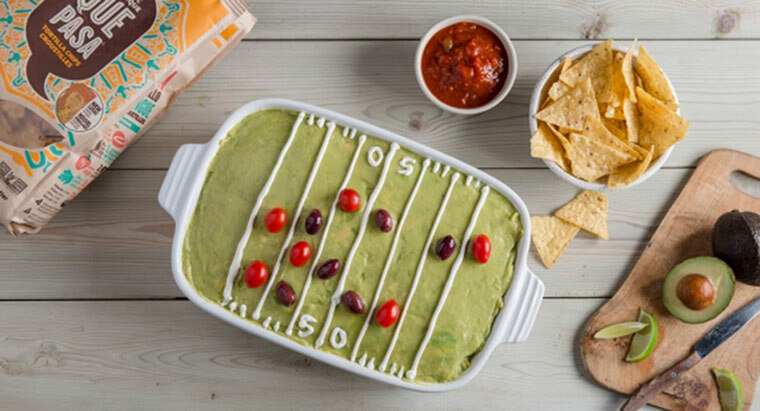 Topping it with guac or greens and decorating it like a field is a great way to play up the football theme. We also rather love this gluten-free romesco dip if you’re looking to mix it up. Gourmet Popcorn: Take a page out of our book and go all the way gourmet with your popcorn. You can go savory, sweet, or somewhere in between. And remember, popping your own is a piece of cake! Roasted Nuts: You know you love the spicy roasted nuts they serve at bars and restaurants, and making your own at home is really quite easy. Just maybe make a few more than you think you’ll need — they go fast!